One gardener's view of her garden and her thoughts on life. Well it's November and we have put the garden away, so to speak. Leaves have been bundled up and put on the compost or put out for the city's pickup for compost. Now it's time to reflect on the whole revamp. I would say it was very successful but as with everything else a lot of things didn't get done or need to be fixed. Currantly hedging my bets:My thinking here is now just the opposite as in the summer. The neighbour has drastically cut back his currant hedge leaving me with a much wider space. I now think it would be good to plant the scarlet geraniums, dusty miller, lobelia and alyssum all along this strip and dig up and plant the violets and periwinkle somewhere else in the back garden - a good candidate for the pond area. I have light gardens in the basement and might try starting seeds for the geraniums, dusty miller, lobelia and alyssum under them. These are views of the currant hedge in summer 1998. I did not get to plant any bulbs this fall as we were working on the pond, etc. all October, So this will be a something to think about for next year. Herbal walk: grew very well this year even after the rough treatment by the chimney guys. I had some leftover tomatoes and stuck them in here. As the sun is only there for three hours, I didn't get any tomatoes but lots of nice green leaves to look at. Host of hostas: survived and thrived, chimney guys and all. Gosh they are tenacious. The other plants here did well, too. Klaus finished off this side of the border with pea gravel as more "scallop potatoes" here would have made the sidewalk seem too small. Gota a lotta terracotta: Ralph and Shirley and the three young ones all left the nest. I didn't get any pictures because it was too dark there. I could have come closer but the robins got nervous if you came too close or stayed too long. I have brought in and potted on all the mother coleus from here. I have taken cuttings and they have already rooted. I am going to plant lots of coleus next year and might change the name of the back door container garden to Coleus Are Us. The pansies and violas I planted here all got too leggy and most of them died out; but I will plant them again as they start the season out with a bang. Besides, I really like pansies and violas. Racoon place: is still trying to recover from the chimney guys' onslaught. I just hope that the peonies survive asthey are as old as the house. I have already cut down the peonies for the winter. To the left is a view of Racoon Place, Host of Hostas and a small glimpse of the planter that Bandit, our neighbour's dog can't sit on. In the distance there is Ba Ba Lambs Ears. Ba Ba Lambs Ears:Brenda and I never got around to making the rhubarb stepping stones. Oh well, there is always next year. Brenda looked in on the gardening page and said, "Now I have to do the stepping stone". Actually I think it would be lots of fun to make one of them and others to put here and there. Mint Just Mint: is just mint and of course did well and the long planter box was nice as usual. I want my tuberous begonias back, though. I really missed them. Christopher Robin's House: Turned out even better than Klaus and I could have imagined. 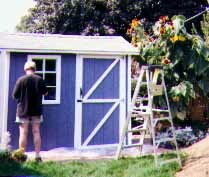 The Wedgewood blue body of the tool shed surrounded by the white trim makes it look like a little doll's house and very sweet. I love the window box and faux shutters that Klaus gave me for my birthday. I will plant the same geraniums, cup flowers and bocopa. 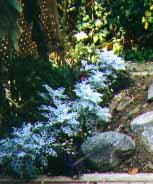 The lobelia gave out in the heat and the dusty miller grew too tall. 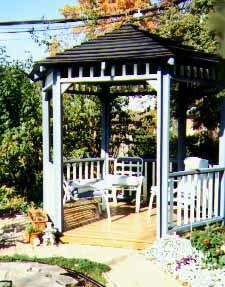 Now that I know what I want to plant there I will plant more hanging varieties. Eeyores Thistle Patch: has become a great catch-all for the wheel barrow, ladder, bike, bags of sand, stone and potting soil. It is also a staging area for potting up plants. 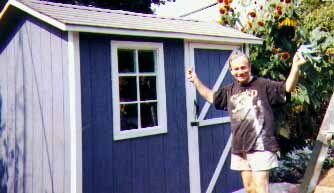 I am going to store plastic pots here and behind the tool shed for over wintering. It is so much better than the skinny path we had before or tramping through the garden. Eeyores Special Place: The sunflowers were just gorgeous as you can see by Christopher Robin's House pictures. Some of the sunflowers grew 10 to 12 feet tall. The blue jays, cardinals and acrobatic squirrels just loved them. The squirrels would hang by their feet from the down turned sunflowers and reach underneath and grab seeds with their front paws. The other plants flourished at the front. The sunflowers started to take over just when the perennials started to wane. These were the Dusty Miller beneath the sunflowers. (They sort of look like thistles and did very well). 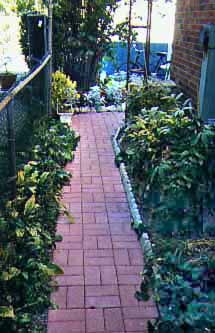 Rose walkway;some of the sidewalk stones from the front walkway are used here. They were very heavy about 100 lbs. a piece. The roses looked very beautiful right from the spring until mid September. They really need to be cut back in the spring. They have become too tall and hard to manage. The Lawn: was reseeded here and will be tackled next spring with the Jerry Baker treatments. Look out lawn: we are after you next year, both here and in the front. Klaus has got himself some of those spiked sandals to aerate the lawn as he cuts or puts on fertilizer. The neighbours will probably shake their heads again, and think, what are they up to now. 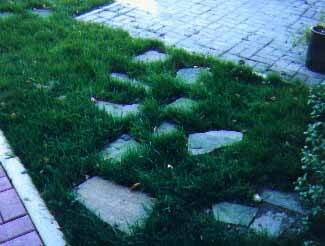 The stones are to prevent wear patches in the lawn.